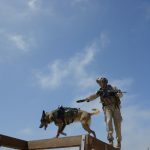 Gene Hackman calls the Marines “America’s international 911 responders.” In Yuma, Arizona, they undergo an intensive, seven-week training course, learning maneuvers that allow the Marines to attack in battle or to deftly deliver humanitarian aid or disaster relief. The circumstances that bring about these emergency responses are ever-changing, and the front line must be fast on its feet. In Yuma they work with re-enactors to load “victims” onto Medevac choppers and distribute supplies. 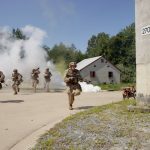 To hone warfare entry and exit techniques, the team practices on nearby “Yodaville,” a built combat town utilized when training with live-fire exercises. Whether the team is employing the latest laser technology, fire power from strategically timed gunship runs, or the impressive, heavy-lifting CH-53 helicopter to load in personnel and equipment, these Marines must quickly assess a given situation, advance, and strike. Jets and attack helicopters support ground troops with absolute precision; these aircraft will save lives in real combat situations. When in combat situations, “getting in” isn’t the only requirement. Getting out is equally as important. Because hundreds of Marines have drowned when their helicopters were submerged, all of today’s Marines learn how to escape a downed helicopter. 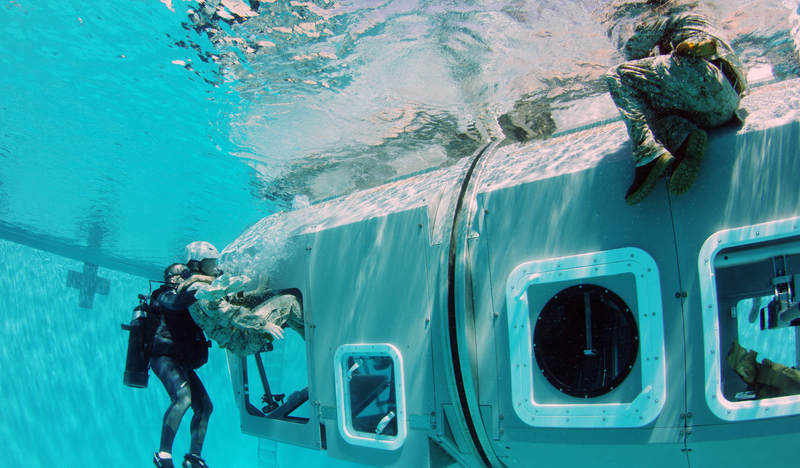 The “Dunker,” a capsule built to the scale of the inside of a helicopter, rotates violently underwater in the Helo Dunker training pool. Each Marine trains in it three times—the last time while blindfolded. One Marine says it was the scariest experience in all his training.